My family has always had a multitude of pets. I grew up with dogs, cats, turtles, rodents, and more. 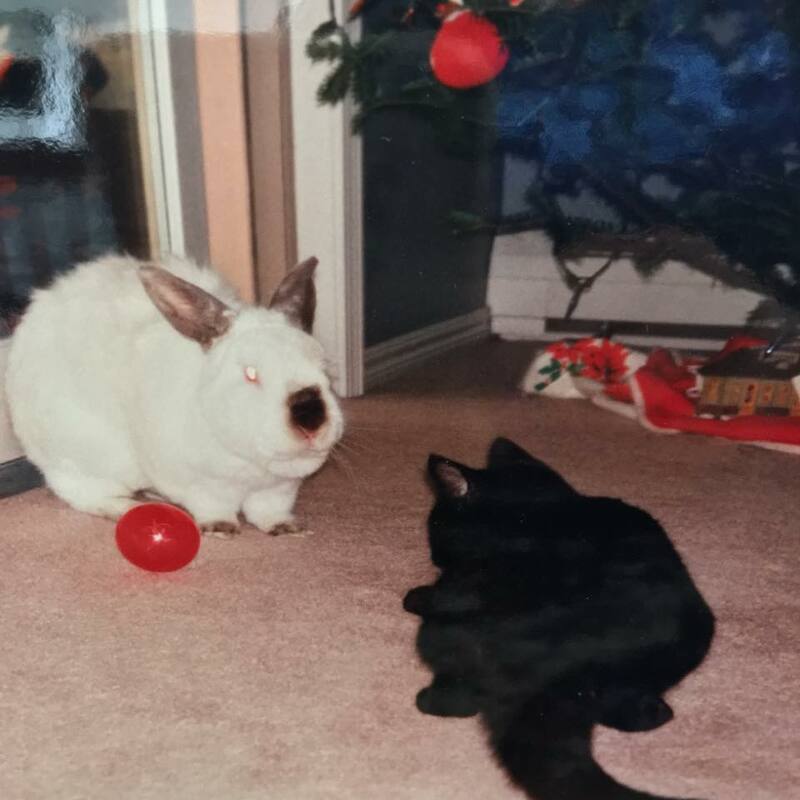 We even had a very special Siamese rabbit named Christmas. Yes, Christmas. Normal people have bunnies named Peter, but, hey, my little sister was only five when she found him in a New Jersey parking lot. Christmas was a New Jersey street tough masquerading as an adorable bunny. He spent ten happy years terrorizing the family Labrador and several cats while eating the antique Italian Provincial dining room set. I loved Christmas, but I opted for cats when I had my own place. My Chinese-American husband opted for big dogs. When my in-laws arrived, the dogs made friends immediately. The cats hid. My mother-in-law was insulted. “I call ‘kitty, kitty,” and sometimes the big one, he will hold still for a minute, but then he runs away. The little cat! Pah! She wants nothing to do with me!” Sunny continued to make overtures, which Commando Cat eventually accepted. He’s the not-so-smart cat. Jay refused at first, but eventually he approached Commando Cat’s scratching post and gingerly tapped the cat. Commando Cat purred. “In China, you eat cat,” Jay announced. I laughed, sure that Jay was messing with the white girl. And then I saw that his tapping looked like German hausfrau squeezing a melon for ripeness. I snatched Commando Cat away. He yowled at me and tried to return to his new friend Jay. I told you he was the stupid cat. “These are my PETS,” I informed Jay. My mother-in-law joined us, asking what we were talking about. I told her that Jay wanted to know how old Fey was. Sunny and Jay conversed in Cantonese while I carted the Commando Cat to our bedroom and shut the door. When I returned to the office, Sunny was telling off Jay. I cheered my mother-in-law on silently. Go, Sunny! You tell him what’s what here in America, where we make a distinction between food and pet. Jay barked again in Cantonese. Wait, what? My in-laws were arguing over the proper age of canine and feline cuisine, not whether eating my pets was allowed. Jesus. Fey and Woofie were young dogs, barely a year old. The cats were eleven and eight. If Sunny was right, they were all aged to perfection. Then sanity returned. Surely even in-laws as intrusive mine wouldn’t roast our pets. To my eternal shame, I unthinkingly argued, “No way! Fey’s too skinny! We’d have to eat Woofie, he’s much fatter!” Then I slammed a hand over my mouth. Uh-oh. I suspected the story of Bunny was not going to be a happy one – at least not by WASP standards. But Bunny’s story must have been hysterical by Chinese standards. Sunny giggled as she related how she and Jay decided that a rabbit belonged in the stewpot. They picked Andy’s favorite, because Bunny was the fattest (probably from being hand-fed by Andy – oh, the irony). Now, while Jay and Sunny planned to efficiently emulate their agrarian ancestors, they grew up in the city of Hong Kong. Neither one had any practical expertise in slaughtering animals. Sunny laughed for a full minute. Even Jay cracked a smile. I held onto the faint hope that my in-laws were pranking me. But no. When Andy got home, he not only confirmed the story, he even chuckled as I told him how his mother laughed. Apparently, my husband was less traumatized than I was. I eventually steeled myself to ask what happened to the remaining rabbits. “Well, we didn’t eat them. A neighbor’s dog did after it got loose.” Andy offered me a box of tissues. The next time Andy and I visited my Ex-stepmother, we met her latest pet rabbit, Rascal. Rascal was an ill-tempered rabbit. He bit me twice. Andy offered to put him in the stewpot. I scolded him. Rascal was still a pet. Thereafter, every time we moved Rascal’s cage, Andy did his best impression of Hannibal Lechter licking his chops. I’m pretty sure he’s just screwing with me. For those worried about our pets, fear not. They all survived. Sunny even sang the dogs to sleep while petting them: “Sleepy time, Fey, go to sleep, sleepy dog.” And Fey would close her eyes, never guessing that, but for time & geography, she might have been dinner. Wily old Bat Cat, however, stayed under the bed until my in-laws were gone. I’d like to counter the “poor wee Wilbur the pig” with the fact that pigs also have no issue with eating humans, given the chance. o.O …I’m almost convinced rabbits would too, if they were bigger. I’m glad your pets remained safe and well, though! I did not know this about crayfish as pets not worthy enough for food trend! Thanks for sharing. Yeah, in the south, people eat tons of them. Pigs will eat ANYTHING. And as my Dr. Sis loves to tell people, the pig that eats ONLY another pig’s crap gains the most weight. I did not know that about pigs. Learning all round here! o.O; Almost impressed as pig poo smells awful. Horse and cow dung, not so much. When I was 4 or 5 we kept a pet rabbit. One day it disappeared and I was worried he would have fell from the balcony. I remember my mum asking the doorman if he had seen a rabbit running around. But we never found him. NOOOOOO! Oh, Marta! Did you feel utterly betrayed, or were you like Andy, shrugging it off? I was more like Andy hahaha. Many years had passed so no point in being mad. It also seemed that the rabbit had been destined to the pot since the beginning (it was actually a farm rabbit that someone gave my parents). I suspect I will never know just how much Andy’s dad was jerking my chain about eating the pets. I mean, Jay and Sunny had a little dog at home, but at the same time, if they lived with us and it was the zombie apocalypse, they’d probably have no compunction about eating our animals. Which is very hard for privileged white Americans to wrap their heads around. Our supermarkets and fast-food restaurants are shiny, bright, and far removed from actual slaughter. Many people I know are opposed to hunting — not BAMBI! — but it seems more honest. (As long as the hunted animal is not endangered, it’s not just for sport, and you eat the whole thing.) The entire East Coast is overrun with deer. I’m starting to think your in-laws would have no compunction about eating *you* if there was a zombie apocalypse. No, no, they would sacrifice themselves, first. To feed their Number One Son, of course. Not sure ex-Stepmother has ever really forgiven me for suggesting that when Rascal escapes, she should put a sign out telling the coyotes it is feeling time. Ha! Although Andy thinks eating him after he tried to eat us is much more poetic. Bat cat was probably the smartest living thing in that house. I think I would have stayed under the bed for the duration of the visit. Bat Cat is a very cautious cat. Also, she pretty much loves only me. Much to Sunny’s chagrin. Bat cat is smart cat. I usually enjoy reading your blog, although I haven’t commented. However, this time I must say I feel really bad reading this… I know I am overly sensitive when it comes to animals, but reading that description of your in-laws killing the poor bunny so cruelly was really awful. I know that the meat industry is also horrible and I’m not trying to be on some high horse here, but maybe less gruesome descriptions next time? Or some sort of warning of animal abuse? I can add that I also cried when I saw baby bunnies on sale on the streets in Beijing, so yeah, overly sensitive. Christmas was really cute though! Oh, I totally understand. Thank you for commenting and I am so sorry about the bunnies. It was a tough call as to whether or not posting this was gratuitously cruel. I actually edited it down (yes, it was worse), but you’re right, a trigger warning for the softhearted might have been a good idea. Awww.. the poor bunnies 🙁 What is it with Asian parents and wanting to get rid of bunnies? We had a pet bunny and my mom told me it ‘ran away,’ but years later I found out she just let it go (better than eating him, I suppose). In my small po-dunk town we had one Chinese restaurant, and the family running it were the only Chinese people in town. A nasty rumor went around that they served and ate dog/cat and business dropped significantly. I was upset because I thought: how could people be so racist! Just because you hear that Chinese people eat dog on TV doesn’t mean they really do! And then I went to China, and I saw dog on the menu… haha. It was true. I didn’t order it, couldn’t bring myself to do it. No, I couldn’t order it, either. If you aren’t brought up to view certain animals as food, you anthropomorphize them to the point where you can’t eat them unless maybe you are starving. Andy, on the other hand, can eat anything. So he will survive the zombie apocalypse. I would be honored. 🙂 And I’d never met ANY Asian-Americans who ate their pets until I met Andy’s parents. I’m one of those who keeps count, so I’m wondering, what happened to #176? Damn, I have the sharpest readers! If I were rich and not anonymous, I would send prizes to people for catching typos, wrong names, bad linkage, etc. And you would have won the jackpot. (Maybe it would have been a stewpot trophy, ha!) Thanks so much for commenting, Maple. I have fixed the numbering. #176 started as an anniversary post, but it was boring and self-indulgent. I nixed it in favor of “Pets Versus Dinner,” and then oops! Forgot to change the # in what would have been the 177th post. Glad you caught that. Well done. Also, thanks for being polite about it. It’s hilarious that you offered. The last critique did, in fact, mention that I desperately needed a Table of Contents to keep the chapter #s straight.